Some might see this as trying to take advantage of a situation, and they would be right. My life, as a Christian is to bring glory and honor to Jesus Christ, so if I have a chance to stand with my brothers in Christ I will. If I have a chance to spread the gospel well I’m doing that then I will take the time. So to start I want to say that I believe in the traditional definition of marriage. Volatile words I know, and some of you will probably never read this blog again. 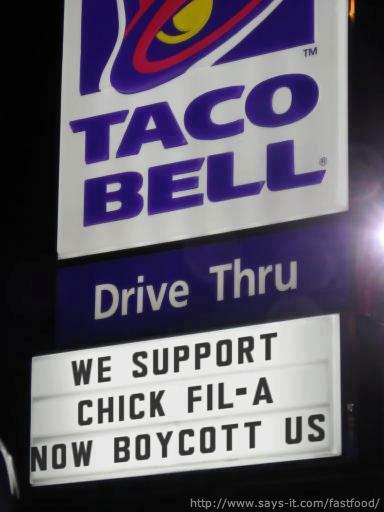 But I stand with with the owners of Chick Fill-A. I know that everyone’s said it, I know that thousands of people have agreed with him and posted it on facebook, but I too want to come out and say it. But before you boycott me consider this, while I do believe in the traditional view of marriage between a man and a woman. I do not believe in the gospel of hate that is preached by groups like Westboro Baptist Church and the Fred Phelps camp. In fact some of my closest friends have chosen alternative lifestyles. I may not agree with them but I do still love them and will continue to be friends with them. Honestly, I don’t think the owner of Chick Fill-A does either, heck I bet his stores have employees of alternative lifestyles. Like Mike Huckabee and others have pointed out the hiring process doesn’t ask you for your orientation, I’ve never seen one who does. The bottom line is that I’m standing with my brother in Christ. As the rest of the Fast Food Chains have decided to do, as the rest of the Christian body should do. Not in hate, not to demonize or tear down a group of people. We stand with Him in Christ and in love. So today let’s go and support Chick Fill-A tomorrow because they aren’t discriminating, they aren’t being vicious like Westboro, the owner is simply stating his beliefs. If you can’t tolerate those beliefs just ignore them, if you don’t agree with my beliefs then ignore them, if you can’t ignore me boycott me.